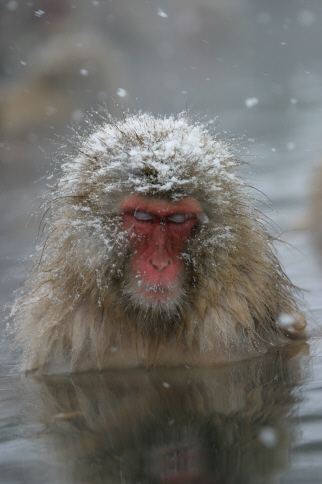 You might not have heard that name but you have probably heard about a place in Nagano where you can see "snow monkeys" (Japanese Macaque) chilling out in an onsen hot spring. 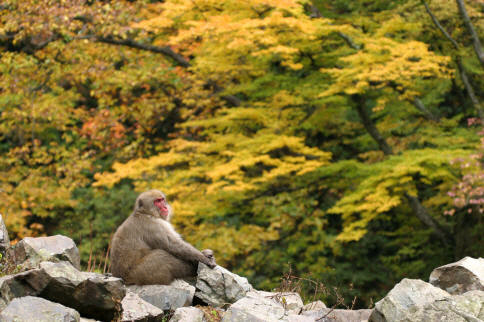 The Jigokudani Yaenkoen park opened in 1964 and since then many thousands of people from around the world have visited the park to observe the lifestyle of the Japanese Macaque. 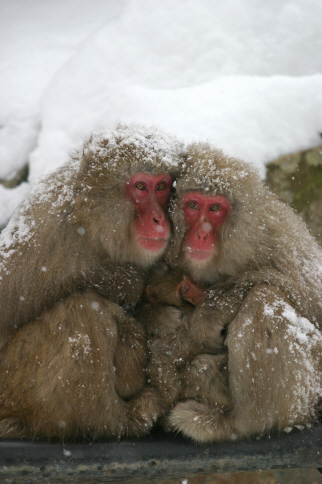 The Japanese Macaque (Macaca fuscata) is a monkey species native to northern Japan, and is the most northern-living non-human primate, surviving winter temperatures of below -15 °C. They have brown-gray fur, a red face, hands and bottom, and a short tail - and often seem remarkably human like. In the wild they spend most of their time in forests and feed on seeds, buds, fruit, invertebrates, berries, leaves, and bark. The monkeys have a body length ranging from 80 to 95 cm. The males weigh around 10-14 kg while the females are usually around 5.5 kg. The park is located in the Yokoyu River valley, which flows down from Shiga Kogen. At an elevation of 850 meters, the area is called Jigokudani ("Hell's Valley") due to the steep cliffs and hot water steaming out from the earth's surface. 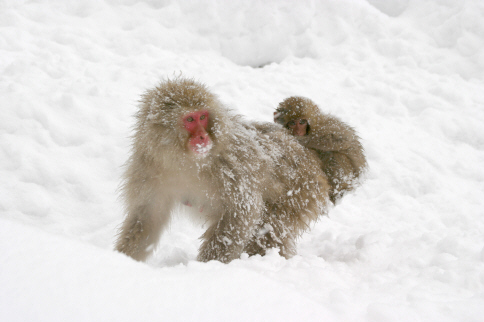 It's also a fairly harsh environment in winter with snow on the ground for a third of the year, but it is also a paradise for the couple of hundred monkeys that live there. We're lucky too, because we can enter their world and watch them enjoying themselves. 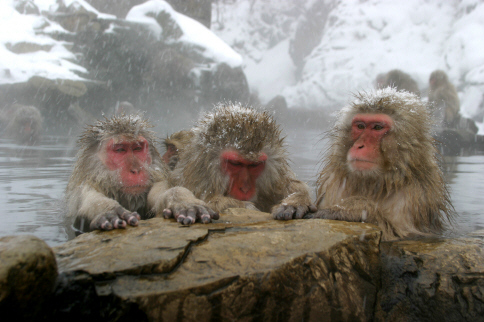 Watching the monkeys play, take a leisurely onsen - or even swim in the onsen - is a lot of fun. All the time the monkeys basically just ignore their human watchers and just get on with whatever it is they want to be doing. 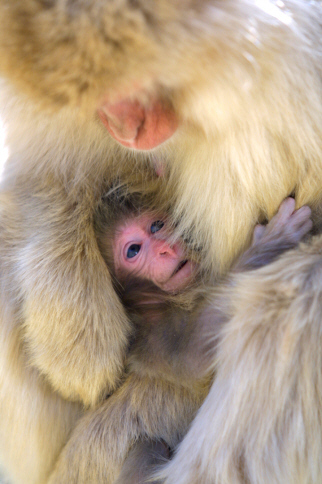 If you are in the area, a visit to see the monkeys of Jigokudani is highly recommended. Don't forget your camera and expect to meet more non-Japanese people too. With more worldwide attention and increasing popularity, some days it can get very busy. Not that it seems to bother the monkeys! Please note: Jigokudani is not actually found 'in' Shiga Kogen, but rather at the base of the Shiga Kogen region. (It's about 10km/20 minutes drive up to the ski resorts that make up Shiga Kogen). Other ski resorts areas within an hour from Jigokudani include Ryuo Ski Park, Nozawa Onsen, Madarao Kogen and the resorts in Myoko amongst others. Jigokudani is located in Yamanouchi town, at the base of the Shiga Kogen region of Nagano Prefecture. Other ski resorts within an hour from Jigokudani include Ryuo Ski Park, Nozawa Onsen, Madarao Kogen and the resorts in Myoko amongst others. Weather forecasts for each ski resort can be found on individual resort pages on SnowJapan - updated throughout the year. From JR Tokyo Station, take the JR Shinkansen to Nagano. From JR Nagano Station, take the Nagano Dentetsu train to Yudanaka. From Yudanaka, take a bus or taxi to Kanbayashi Onsen. From there, it's about a 30 minutes walk to the Jigokudani Yaen-koen entrance. Exit the Joshinentsu Highway at the Shinshu Nakano I.C. Follow Route 292 towards Shiga Kogen. 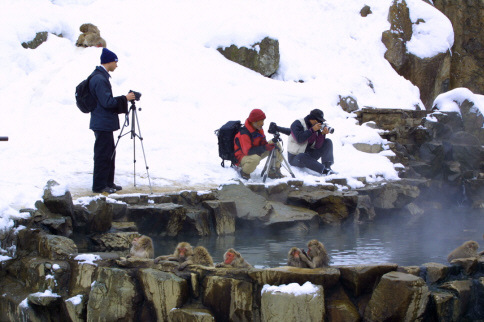 Before you , you should see a sign for Kanbayashi Onsen the monkey park. Park your car and then walk to the Jigokudani Yaen-koen entrance (about 30 minutes). As it takes 30 minutes or so to walk to the entrance, it's recommended that you have at least two hours to enjoy the park. Jigokudani is open throughout the year. Snow Japan would like to thank Jigokudani for use of the above official photos..